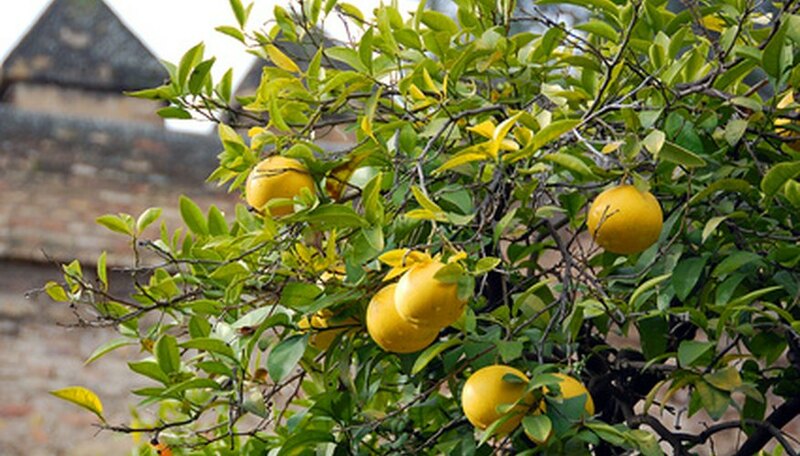 Of all the citrus fruits, lemon is the easiest to root from a cutting. Rooting cuttings is quicker then growing from seed, and you will be getting an identical clone of the parent plant. Pot up a few cuttings of your favorite tree to give away to friends and family. Fill a 6- to 8-inch pot with a mixture of equal parts perlite and peat moss. Wet the mixture until it is evenly damp all the way through. Make a hole in the center of the pot 2 inches deep and approximately the width of your index finger. Take a 6-inch semi-hardwood cutting from the lemon tree you are propagating. Semi-hardwood cuttings are taken in late summer; they are that year's growth that is beginning to turn from green to woody. Make the cut at a 45-degree angle just below where a leaf attaches to the stem. Remove all but the top three leaves using a sharp knife or pruning shears. Dip the bottom 2 inches of the cutting in liquid hormone rooting mix. You can find rooting hormone at your local garden store. Place the bottom 2 inches of the cutting into the hole in the center of the pot, and press the soil down firmly around it. Place a clear plastic bag upside down over the pot. Fasten the plastic bag around the lip of the pot with string or a large twist tie. Place the potted cutting in a sunny area where the temperature is between 75 and 90 degrees F. Check the soil every three days, and water it lightly to keep the soil damp all the way through. The cutting will begin to put out new growth when it has rooted successfully. This usually takes 6 to 12 weeks, although it can take up to two months in cooler conditions. Transplant the cutting into a 15-inch pot one month after it has rooted. Keep the rooted cutting in a warm, sunny area, and water it once or twice a week to keep the soil damp but not saturated. Transplant your cutting into the ground or a permanent pot one year after rooting. Root several cuttings at a time, so if a few fail, your efforts will still be rewarded.